This is beautiful! My mother canned also, and we helped, so I know the labor involved! Your reminiscence is wonderful and the photo is a nostalgic capture. 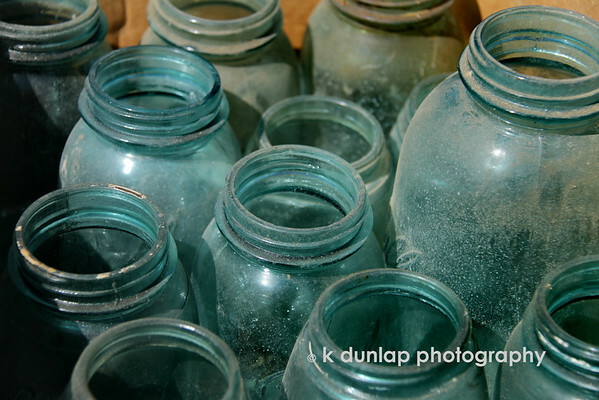 Love the old ball jars. Great comp. This is an awesome photo. I think shooting green bottles is a great idea and all the settled dust gives these an great texture. I love your shot of the Mason jars. Perfectly grouped. Wonderfully lit. Fantastic vintage feel goes along so well with your story. My father was the garden person in my life. He tells a great story about planting tomato plants and his 3 year old (only) daughter going behind him pulling them up as quick as he could plant them:-) I'm sure he waited until I was occupied and silently replanted without a fuss. But it was the start of my love of plants today.